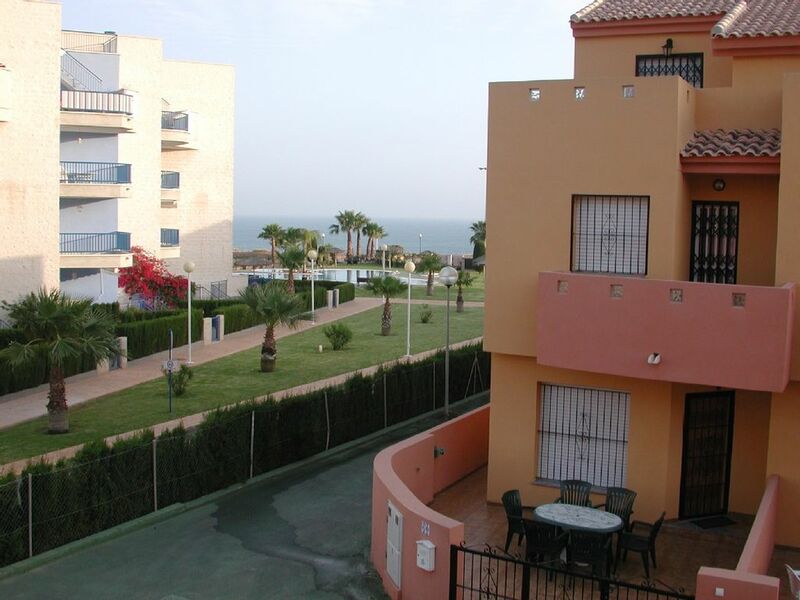 3 Bed Townhouse in Cabo Roig close to the sea. A self catering 3 bed room rental townhouse close to sea and entertainment. Costa BlancaSituated on the south east coast of mainland Spain, the Costa Blanca is renowned for it's sandy white beaches and warm Mediterranean climate. Steeped in history and boasting beautiful mountain views, sweet fragrance orange groves and glistening waters, this picturesque Valencian province has something for everyone. You certainly won't be short of things to explore on the Costa Blanca, whether you wish to delve into it's history and culture or reveal the untold mysteries of the deep blue Mediterranean. TorreviejaTorrevieja has, in recent years, grown to be one of the most popular and important centres on the Mediterranean Sea for residential tourism. Torrevieja's seafront offers a lot of restaurants, tapas bars and street cafes on the very wide promenade which popular for the “Spanish evening stroll”. If you simply wish to relax and soak up the rays, then head for one of Torrevieja's sandy white beaches, which have been awarded the EC's 'Blue Flag' status. You can reserve with a deposit and pay the rest closer to the holiday. Once payment is received we will send the full details of the property and directions to the property and check in details. In addition to the 2 bathrooms there is a outdoor shower provided. The Lounge, Bedroom 1 and Bedroom 2 are air-conditioned. The house is fiber broadband internet enabled by WIFI. The cost is 30 Euros per week. Please advice requirement at the time of booking. 30 Inch LED TV with Blueray player. Smoking allowed only in the terraces and in the front. Please do not smoke in the house. A stressful week in the sun. On arrival we were not told how to access the complex and had to find out after about 1 hour of walking round from a resident in the next block. The bathroom and bed linen needed cleaning. We had to catch a taxi back to the airport as the guy who was suppose to pick us up never turned up so we just about caught our flight home. We could not contact anyone by mobile so we felt a bit stranded. We have booked through this web site on 3 previous occasions but will not be doing so in the future as we would not want to experience anything similar again. Hi Lorraine I am so glad you had a lovely time at the house. I too feel the same way every time I visit the place. Feel free to return whenever. Thank you for the wonderful review. We look forward to welcoming your family again at our house in Cabo Roig. Arrived at about 10 at night from airport booked private transfer took about 50min from alicante,someone there to meet us to let us through security gates and showed us to townhouse,ideal property for the 5 of us,4 ,50+ and my 34 year old daughter,nice and quiet area yet only about 5 to 10 min walk from the strip (shops and bars etc), also 5 min from sea and pathway,ther was a shared pool as well but we didn't use so all in all a really lovely chilled out holiday we couldn't fault. Glad to know you had a lovely time in Spain and you enjoyed your holiday. Thank you for a very positive review. Looking forward to welcoming you back. Ein schönes Ferienhaus. Gemütlich eingerichtet, komplett ausgestattet. Da bleiben keine Wünsche offen. Schlafräume im oberen Stockwerken. Alles in allem waren wir sehr zufrieden. on site :The house is beside swimming, walking, cycling.less then 15 minutes drive away :Close to the house you will find a beach, sailing, water skiing, boat hire, golf, tennis, a restaurant, a food shop. less then 45 minutes drive away :Within easy reach of the house you will find historic sites, a theatre/cinema, shopping areas, a themepark. The house is....20 km from Murcia airport. 15 min from Golf courses. 5 min from Shops and bars. Security deposit of 10% of cost required at the time of booking. The balance is payable once confirmed by the owner. Extras: Cost of cleaning Euros 50 per booking. Compulsory charge payable at the time of booking. You also need to purchase an electricity card from our managers for the actual use of electricity. If you require WIFI the cost is 30 Euros per week and you need to request it at the time of booking since it is pay as you go and I need to inform the provider in advance. Early bird discount!! 10% discount if booking start date is more than 30 days away.